I hope that this book will be useful to a wide variety of interested parties, and that the overall impact will be to improve the quality of life of children and adults who have suffered this injury. The overall theme of this book is simplicity. It has been my experience that simple solutions offer the best results. Interested therapists can pursue a course completion certificate. More information is available at "Assoication of Brachial plexus therapists" website. Read more about "Benefits of a course completion certificate". Great News!!! 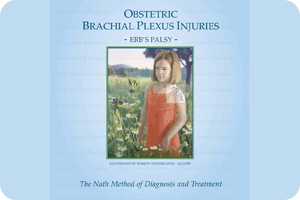 InTech has recently added a chapter written by Dr. Nath et al to their book Peripheral Neuropathy "Surgical Management of Obstetric Brachial Plexus Palsy Secondary Deformities." For a free copy of the chapter, please click on the link. Before and After Surgery pictures of Dr. Nath's Patients. Brachial Plexus Injury, Triangle Tilt, Mod Quad and more. Before and After Surgery videos of Dr. Nath's Patients. Brachial Plexus Injury, Triangle Tilt, Mod Quad and much more. Dr. Nath is a specialist in brachial plexus (erb's palsy) injury and treatment surgery. Dr. Nath, who serves as the director of the Texas Nerve and Paralysis Institute, has founded a Brachial Plexus clinic & surgery center in Houston Texas, West Palm Beach Florida and Dubai UAE to offer surgeries to both children and adult patients who suffer from nerve injuries and unusual paralysis cases. At the outreach event you can receive your first hands-on evaluation or come for a follow-up visit. Using a Referral System is easy, fast and effective. Let us know how we doing. On-line registrar of therapists with expertise in this area.